T'ai Chi Chuan (also written as Taiji, Taijizhang, Tàijíquán) is a system of movement, meditation, and self-defense from ancient Chinese culture. The T'ai Chi form consists of a sequence of postures, strung together in smooth, slow, continuous movement. The movements of the T'ai Chi form follow a precise system of balance and relaxation. The most important principle in T'ai Chi is relaxation. 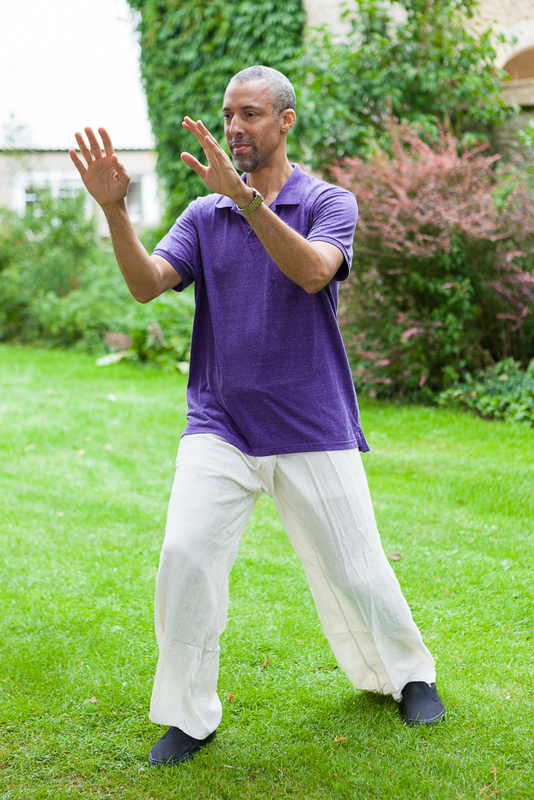 In doing the T'ai Chi form, we become aware of where we are relaxed and where we hold tension. The postures and movements help the body to release tension in the muscles and encourage flexibility in the joints. The slow shifting of weight from foot to foot strengthens the legs and helps the circulation of blood through the body: the legs are considered the 2nd pulmonary pump, and in helping to move the blood they reduce the workload of the heart. The feet are flat on the ground and the form is practiced low, with the knees relaxed, developing our stability and balance. The spine is straight, improving our posture. On a deeper level, the practice of T'ai Chi improves our health by encouraging the circulation of our internal energy (chi) through the body. The movement of chi nourishes the health of the internal organs. Regular practice of the form helps to send the chi through the body in the best order, in a balanced flow. So both for our ch'i (internally) and for our joints and musculature (externally) T'ai Chi is an essential practice for our health. Traditionally the T'ai Chi form is performed daily: as soon as we get up in the morning and just before going to bed at night. The T'ai Chi player comes to experience that there is an intimate mind-body-spirit connection. As we learn where we have physical tension and let it go, we also become aware of mental or emotional tensions that we accumulate: from our job, from family or relationships, from the stresses of day-to-day life. 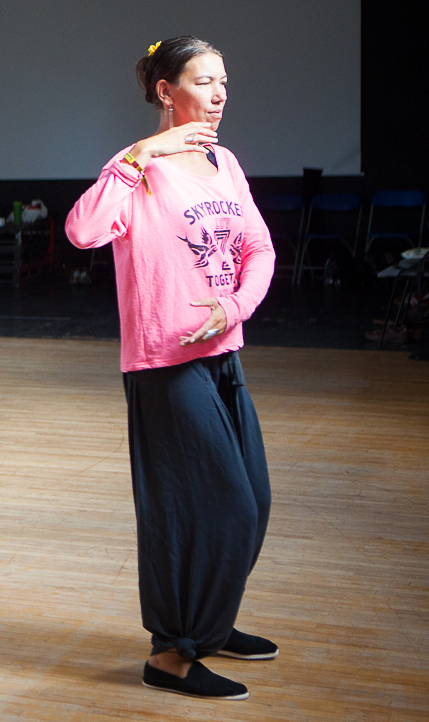 In practicing the form, we bring our awareness down to the balance-point of the body (Tan t'ien) and feel our body and our movements from this centre. In relaxing our mind and emotions to the tan t'ien, the internal chatter we always have can calm and subside. The meditation of T'ai Chi is not one in which we shut out the outside world to go within. It is a balancing of internal and external awareness. It allows us to deal with the world from a more grounded, centred base. In this way, T'ai Chi meditation is a very practical tool, at work for us through our day. The title T'ai Chi Chuan can be translated as "Supreme Ultimate Fist" but its effectiveness is best shown as a non-aggressive self-defense. Different from the hard arts where force is met with force, in T'ai Chi one yields before force, rotates out of its way, redirects it. The training of T'ai Chi teaches us to react with relaxation, timing, and balance. 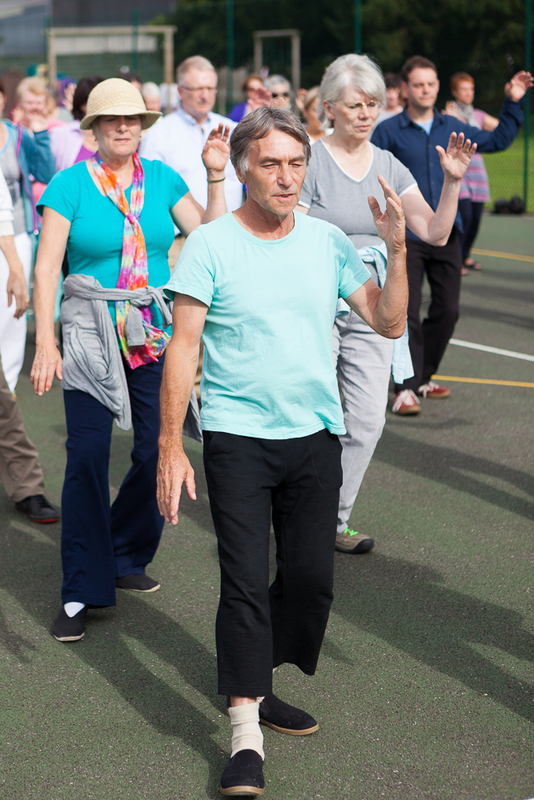 Where other martial arts decline as one ages, the practice of T'ai Chi improves through our whole life. 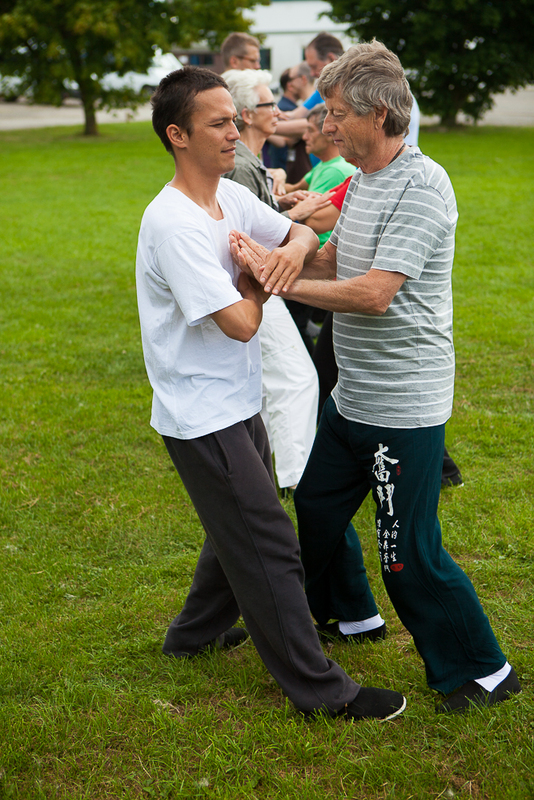 The training of T'ai Chi as a self-defense is principally through "Push Hands" (T'ui Shou) practice, though "Sensing Hands" might be a better translation. In this partner exercise, we use postures and movements from the form, and kinesthetically "listen" for our partner's balance, timing, and tension. Through the Push Hands practice we learn to play with the energy of their movements, and develop relaxation and balance in our response to force coming toward us. Through our daily practice of this slow and conscious movement, we re-connect with our essential self, so our T'ai Chi is a path to deeper self-understanding and transcendent spirit. Although T'ai Chi Chuan is an embodiment of Confucian and Taoist philosophy, it speaks the universal language of harmony and unity. The T'ai Chi symbol is the familiar black and white circle, gracefully depicting the balance of opposites, with each half containing the seed of its opposite. Ultimately, we see how our individual sense of balance and harmony expands to our interaction with others and the world around us.